This is yet another incredible creation from my wife. 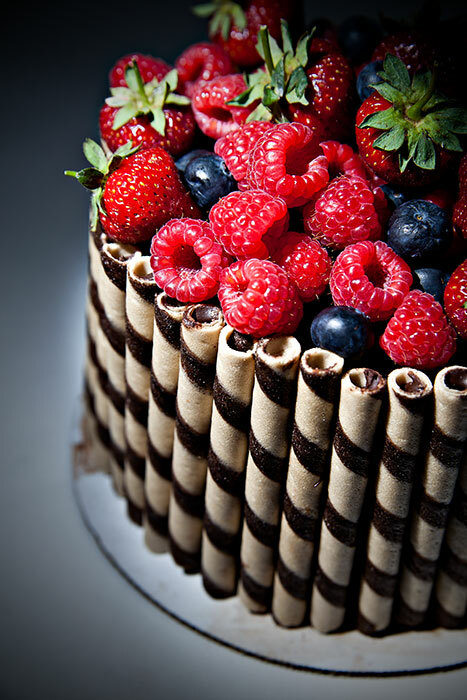 It’s a chocolate cake with strawberry filling, covered in chocolate gnocche and lined with wafer sticks. On top are fresh organic strawberries, raspberries and blueberries. It’s a delicious looking and tasting cake. Speaking of raspberries; later this week they will be ripe for picking. Raspberries have to be my favorite berry. Red raspberries are good but I really like the black raspberries. For this photo I used a Canon 580EXII flash with a white paper snoot to direct the light only onto the fruit and front left side of the cake. I did this because I really wanted to highlight the colorful berries on the top of the cake. So what is your favorite type of cake?